You'll be £4.99 closer to your next £10.00 credit when you purchase Tracing Your Service Women Ancestors. What's this? Whether you are interested in the career of an individual service woman or just want to know more about the part played by service women in a particular war or campaign, this is the book for you. Assuming that the reader has no prior knowledge of service women, Mary Ingham explains which records survive, where they can be found and how they can help in your research. She also vividly describes the role of women with the armed services from the Crimean War of the 1850s to the aftermath of the First World War and offers an insight into what the records can tell you about the career of an ancestor who served at home or abroad. From the army schoolmistresses to the Women's Land Army, including British army, naval, air force and Indian army nursing services, the FANY, VADs, women doctors and the Women's Legion, her account outlines the origins and history of each service, describes uniforms and gives examples of daily life and likely experiences. This is the book you need if you want to follow up those clues in your family's history – stories heard from older relatives, pictures in family photograph albums, handed-down uniforms, badges or medals that seem to indicate that one of your women ancestors served in wartime. As featured in Discover Your History Magazine. This is a unique and perhaps, the only resource for families whose female ancestors served in support of the armed forces. It provides both context and guidance to the researcher. Whether you are interested in the career of an individual service woman or just want to know more about the part played by service women in a particular war or campaign, this book is an excellent starting point. Assuming that the reader has no prior knowledge of service women, Mary Ingham explains which records survive, where they can be found, and how they can help in your research. She also vividly describes the role of women with the armed services from the Crimean War of the 1850's to the aftermath of the First World War. …this compact book packs an enormous amount of expertise and guidance into a limited space in a form which I think has never been done before – therefore commending it to the experienced researcher as much as the novice. This will save vast amounts of time, money and effort in research which could rapidly recoup its purchase cost. This comprehensive illustrated and indexed guide, concentrates on the period from the Crimean War of 1850s to the 1920s with the main focus being the Great War. It is aimed at those who have little knowledge of women under arms and their records. The author and expert, Mary Ingham, has written many articles on the topic. An excellent and really useful reference work for researching a women who served with the military you will find this book enlightening. This book is divided into two main sections each of which deals with service women at home and abroad. The first deals with the armed services including nursing and the second covers the various auxiliary services. There is a history of each service, details of different uniforms and a description of daily life and experiences, some of which are quite vivid. The book mainly covers the period from the Crimean War to the end of the First World War for which records are in the public domain. There is detailed information on the records which survive and where they are located. It is surprising to learn that women have served alongside their men folk in the armed services since the 1850s. This book deals with records about pioneering women ancestors, up to the 1920s, the main period of which records are available. With many illustrations this gives a very comprehensive history of how women served their country, as well as enabling you to find the records of this service. Whether you are interested in the career of an individual service woman or just want to know more about the part played by service women in a particular war or campaign, this is the book for you. This is the book you need if you want to follow up those clues in your family history – stories heard from older relatives, pictures in family photograph albums, handed-down uniforms, badges or medals that seem to indicate that one of your women ancestors served in wartime. This quality volume is outstanding and it offers significant help to researchers. The history of Service Women stretches back to before the Crimean War of the 1850s. These women were the forerunners of today’s women’s services and much tribute is due to these pioneers. If you do have female ancestors who served in the British forces or their allied organisations then this book will be exceedingly useful. It is highly recommended and it is undoubtedly the best book I have ever seen on this topic for well over a decade. Given its research leads and excellent commentary this book will significantly add value to researching your female military ancestors and a ‘well done’ is due to the author. 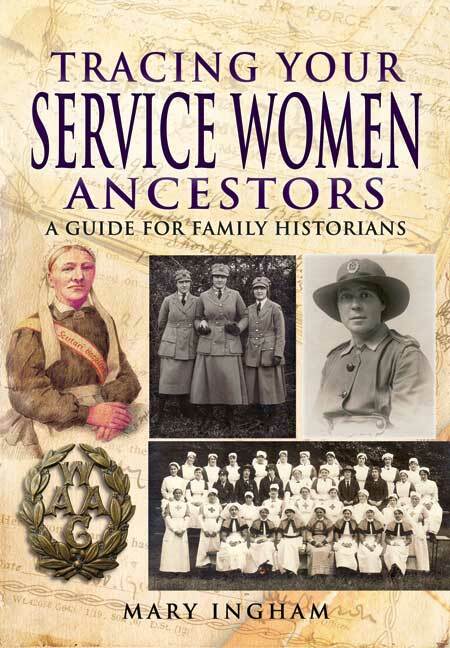 Comprehensive and helpful guide to researching servicewomen, from the 1850s to the 1930s. The author explains which records survive, where they can be found, and how they can help in your research. For centuries, women associated with the British Army as camp followers and soldier’s wives, but it was in the 19th century that they began to have an official role, firstly as schoolmistresses and nurses, and later, in the First World War, filling a wide variety of other roles to free men for the front line and the fleet. This comprehensive guide to their records, spanning the years up to the early 1920s, fills a huge gap that will be seized on by everyone with a female ancestor, who ‘did her bit’. This carefully researched and well-written guide shows examples of their records, explains how to find and interpret them, illustrated uniforms and badges and explains the jobs that women carried out. It’s also illustrated with plenty of photographs and examples of individuals throughout. It's a great book - a must have! There is so little written on women’s work during the Great War, and what exists often takes the form of memoirs, reminiscences and diaries. Until now there has been a dearth of factual information and detail to help the family historian uncover the working life of their female ancestors, with other military sources often failing to recognise how many of them served alongside, or gave support to, our grandfathers, cousins and uncles. Mary Ingham has used her extensive knowledge and meticulous research skills to produce a comprehensive guide that is unique in supplying a wealth of information previously unpublished. It will prove an invaluable aid both to those taking their first steps in family history, and also to the experienced researcher approaching a new and previously untrodden path. I can thoroughly recommend it to anyone with an interest in women’s history. This superb book covers the period up to the end of the Great War, which dominates the content, and takes in the many branches of service women worked in from medical professions to schoolmistresses and all the recognised military branches. Just a scan through the contents list reveals the amazing breadth of subject matter. Why, on page 62 you can find out about the Almeric Paget Massage Corps, a subject just part of a chapter on Military and Naval Masseuses. The inference being the author really knows her stuff. The book will help you chart your way through available records and explain the structure of the branches of service and how your ancestor will have fitted in. The use of photographs is excellent. WRNS, WAAC, WRAF, VAD… women have played an increasing role in the armed services since the 19th century, with their influence increasing during the First and Second World Wars. How does one go about researching a service woman ancestor? What part would she have played in the war effort? What would her uniform have been like? How and where would she have trained? Ideal for the beginner to family history or those new to researching women’s roles in the forces, Mary Ingham’s book broadly covers the Crimean War to the 1940’s, with the bulk of attention given to 1914-1918, and offers guidance as to where and how to find information about a single woman or a branch of women’s services in general, as well as giving an overview of the history of each service and what life would have been like for its members. Mary Ingham’s interest in women ancestors was aroused by research for her first book, Now We Are Thirty. Since starting a specialist family history research service on nurses and women who served in the First World War, she has established herself as an expert on British service women and their records. She has contributed many articles to women’s magazines and also written for Ancestors. This is her third book.